Mouthwatering layers of flavors, textures, and aromas to excite all the senses. Savory and sweet—with a hint of heat. Crispy and juicy all at the same time. And, of course, there’s the childlike joy of sticky fingers. We’re not kidding when we say these are our go-to chicken wings! Place the wings with the thicker skin-side up on a rimmed baking sheet with wire racks. (The wire rack helps promote even cooking). Sprinkle the wings liberally with fine sea salt (or salt of your choice). Bake the wings for 45 minutes. When the wings have 12 minutes left to bake, start the sauce. Heat a medium to large skillet over medium heat, and add the coconut aminos. Add the ginger powder, garlic powder, onion powder, and red pepper flakes (if desired). Once the sauce comes to a simmer, begin stirring. Continue to stir periodically, adjusting the heat as needed to maintain a gentle simmer. Once the sauce has thickened slightly—as you stir it, it should take a few seconds for the sauce to fill back behind your spoon or spatula—you can reduce the heat to low while the wings finish cooking. Place the wings in a large heatproof bowl, and pour the sauce over them. Stir to evenly coat with the sauce, and serve! Break out the grill! A medium-low heat—with periodic flipping to ensure even cooking—should take about 30 minutes to cook the wings completely. Want to kick the umami up a notch? A few drops of your favorite fish sauce should do the trick. The recipe is from Primal Palate – reposted with permission. Hayley and Bill at Primal Palate have written two cook books, Make it Paleo with over 200 grain-free recipes for any occasion, and Make it Paleo II, with more than 175 new grain-free recipes for the Primal Palate. Color me puzzled - the recipe sounds great and I'm going to give it a shot, but where does the sweet or the sticky part come from? Are there residual sugars in the coconut aminos? Part of me wants to puree a date into the sauce. Many reviewers of coconut aminos on Amazon are complaining that it's too sweet. I have not been able to find the ingredients yet, but it looks like they might be sweetening it with coconut nectar which is very sweet and sticky like honey. I made this but thankfully I looked up the carb count before I ate it. 3/4 cup of coconut aminos has 34 carbs! It reduced down to about 2.5 tablespoons so it is not much sauce at all to coat the wings. I did taste it and it definitely was not sweet. I ended up making another sauce with some low carb ketchup, ginger, a tsp of coconut aminos, garlic powder, onion powder, a wee bit of soy sauce and a couple of drops of liquid Splenda. It was really good. Coconut aminos is really expensive where I live. I should have looked up the carb count before I started. I would love it if you could post these recipes in measurements that a swede would know. You've mentioned that more translations of recipes will appear on the swedish site but I can't find just this one. I know I could just convert the measurements by myself, but really I am waaay to lazy to do so! Fish sauce instead of Aminos, much cheaper and tastier imo. Fermented anchovies, salt and a minuscule amount of sugar (usually) is what fish sauce is made of - what could be bad? I think some editing needs to be done on the ingredient list, as there are redundancies (first 5 ingredients in list repeated at the bottom). I don't know where did you get 34 carbs from..
Oh my goodness, these were wonderful. However, we substituted tamari for the coconut aminos, which did not work out. The tamari is way too salty. We'll buy the coconut aminos next time. Cook the wings using the convection feature (if you have it) for 30-35 minutes. Otherwise follow the instructions as written. Convection made the wings super crispy for us. Love! And can't wait to make again. This was delicious! We grilled our chicken drumsticks and then mixed them with the sauce. We used 3 lbs of chicken drumsticks and there was plenty of sauce. We probably could have done 4 lbs and still had plenty of flavor. That would help "dilute" the carbs from the coconut aminos for those that need to be very strict. We also dipped some celery and carrot sticks in the sauce. Very very good!! I would like to see substitutes for exotic ingredients, like coconut aminos. I am single and on a very low budget. There are a lot of recipes on your site that sound luscious but contain ingredients that cost a lot and would last me for 15 years. I am a dietdoctor devotee and on lchf for almost 6 months now. Your website keeps me honest, encouraged and educated. Why is it a moderate low carb meal? What makes it moderate in carbs? 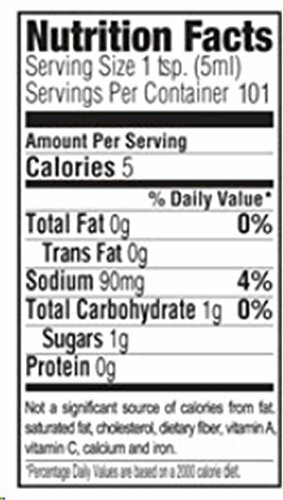 They got the carb count from taking the 3/4 C it calls for...3/4 C is 36 tsp....so for the recipe it is 36g of carbs. The recipe is for 4 servings. 9 grams of carbs per serving. I am allergic to coconut, can't use the aminos. what else can I do? You can use soy sauce but many choose to avoid soy because it can be a hormone disruptor. I love the sauce. I've used it on shrimp and now in their pork and green bell pepper stir fry instead of chili paste. I'm going to make wings for a baby shower. 10/10 recommend. Tamari has the benefit of being gluten free, but it is still soy based. That's for 1 tsp. 3/4 of a cup has 36 tsp.